[2018 Update] So much love for this flavor on the internet that it's no surprise that it's still around (though still exclusive to Target). Still tasty and the nutrition facts have actually gone up slightly in terms of fat content (it sounds really unappetizing when I put it that way). Hopefully most people have tried this one by now. Original review after the break. [New for 2011, GMO-Free in 2015] Oh man, I can't believe it's been almost a week since I first cracked open this ice cream. In fact, I wanted to right down my initial impressions before I went for the second scoop, but I can't wait. 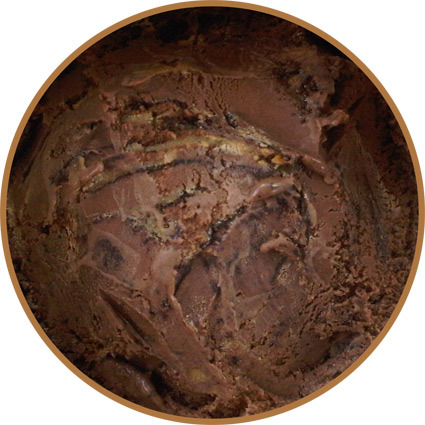 I've been dreaming of peanut butter and chocolate goodness swirled with crunchy goodness. Mmmmmmm. Even with a terrible, non-nonsensical name, I remember that I couldn't wait to try this ice cream. I will pretty much try anything that mixes peanut butter and chocolate... except cereal, that's just weird to me. Last week I hastily dug into my pint that was quickly melting on the outside but solid as a rock on the inside. I wasn't 100% sure what to make of it. Part of me was in heaven, part of me was still deciding. All I know is, 6 days have past and I gotta have more! 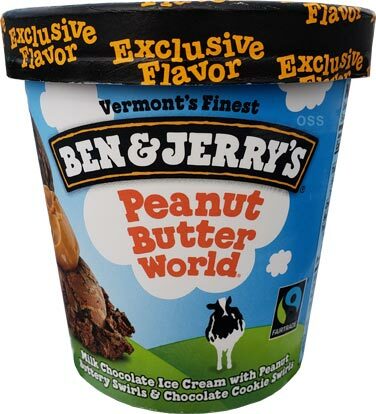 The pint opens, the spoon goes in, and.... mmmmmm, frozen peanut butter bliss. Ahhhhh, I can feel my overheating brain returning to normal. I'm only a few scoops in but I'm determined to finish off the second half of this pint. I can't tell you how glad I am that Ben & Jerry's finally got this awesome cookie swirl back in another flavor. If you are big into the texture of ice creams, you may be a little put off by the solid and cookie like nature of this ice cream, but to me, it's awesome. I'm definitely enjoying it more now then I did last time. I had a thought last week. 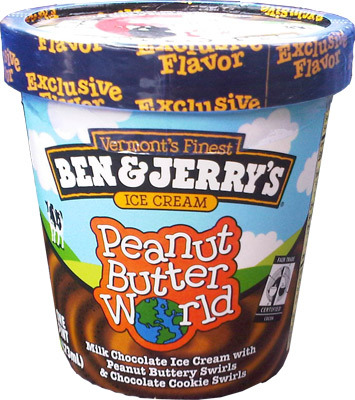 If you took a Klondike Oreo sandwich, replaced the so-so ice cream in the middle with a top notch peanut butter chocolate ice cream blend in the middle, you would have the same taste as you do with Peanut Butter World. The cookie swirl here is very reminiscent of the vibe you get from those big Oreo patties. 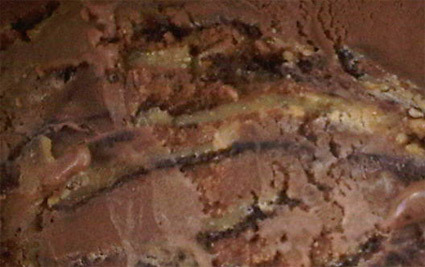 I'm looking at my spoon and there is a wad of peanut butter inside a cluster of chocolate cookie swirl surrounded by B&J's awesome milk chocolate ice cream. The peanut butter has really taken center stage in each and every bite I take. I'm trying to pace myself here. This really is excellent. Keep in mind that for a long time my favorite flavor was Turkey Hill's Chocolate Peanut Butter Cup ice cream which had a similar taste and texture. There's just three bites left... so full... so tasty. It took awhile, but I trained myself to stop when I'm full (not an easy thing for a snackaholic who was taught to not waste food)... well, I'm tempted to stuff myself right now. You know? this stuff smells heavenly! and its gone, good bye my new friend! Look at those calories per serving! LOL! I thought nothing could beat Clusterfluff in calorie counts...I guess I was wrong. Regardless, we gluttons need pictures of this ice cream! have you been able to find fair goodness cake yet?? pictures are coming in a few hours! fair goodness cake? maybe that was the early n ame for volun-tiramisu? This and Clusterfluff may be my only reasons to return to the U.S. in a few weeks. I think Fair Goodness is based on German Chocolate Cake. Fair Goodness Cake is scoop shop only, not in stores. Nice review Dubba, I'm generally not a fan of B&Js chocolate base, but I'd be curious to give this a shot. I missed out on this flavor. Will they ever bring it back? it's not gone! Head to your nearest target, you should be able to find it. They still only carry Berry Voluntary and Volun-tiramisu as their Exclusive flavors where I live. Hmmm, we have all four hanging around in Mass.